A historically limiting factor in making accurate parts with an abrasive waterjet has been that abrasive waterjets typically make a tapered cut. A fast cuts results in a cut that is wider at the top than at the bottom. A slow cut results in a cut that is wider at the bottom than at the top. Theoretically there is a cutting speed for any particular material and thickness that is “just right” and will result in zero taper. As our ongoing R & D efforts improved our understanding of cutting jet behavior we were able to develop a computer model that accurately predicts the amount of taper based on the material being cut, its thickness, the speed of cut and the nozzle parameters of water pressure, orifice size, mixing tube size, abrasive characteristics and abrasive flow rate. That model permitted us to accurately predict the speed at which there would be no taper. This meant that our control software could be enhanced to permit the user to specify a cut quality that we call “zero taper quality” along any particular cutting segment. By doing this the user could create a part that was taper-free. The drawback to this rather elegant solution to taper control is that the cutting speed for “zero taper quality” tends to be slow. This slow speed was acceptable for making parts where just a few key elements needed to be taper-free, but it was a not an optimum solution for making complete parts with the highest possible accuracy in the least amount of time. Our customers want to cut precise parts as quickly as possible, so we decided to take another approach to the problem. We developed the Tilt-A-Jet. This retro-fittable accessory has the ability to tilt the cutting nozzle very precisely (to an accuracy of better than +/-0.06 degrees) in a direction perpendicular to the direction of cut. Our advanced computer model is used to control the tilt so that it automatically compensates for the natural taper of the cutting jet, regardless of the cutting speed. This provides a fast cut, based on the user’s desired cut quality, that is also taper-free. It has the additional benefit of maintaining the taper-free cut even as the nozzle must slow for sharp corners or tight curves. No special programming is required. The OMAX Intelli-Max control software receives geometric input directly from a standard 2-D drawing file (such as a DXF or DWG file) and the computer model automatically controls the degree of tilt needed for taper compensation along each increment of the cutting path. The result is a precise taper-free part that can be made quickly and economically without 3-D programming. As our computer model of jet behavior continues to evolve we have added an additional feature to the Tilt-A-Jet system. We know that even faster cuts are possible, particularly in thicker material, if we tilt the jet slightly forward in the direction of cut. The mechanism of the Tilt-A-Jet enables us to do this quite easily with a simple free control software upgrade. No 3-D programming is required. Once activated the tilt-forward feature is programmed automatically. This has meant even faster taper-free parts for our customers at no additional cost. In addition, software upgrades have allowed our customers to use the same Tilt-A-Jet system to put intentional taper into elements of a part. Once again this requires no 3-D programming and is fully automated. Intentional taper capability is now widely used by our tool and die customers for providing relief in die components. The Tilt-A-Jet accessory has greatly expanded the capabilities of abrasive waterjet cutting by permitting the rapid production of precise taper-free parts and parts with intentional precision taper. This means more applications are now suitable for our technology and more shops are finding a need for our system. 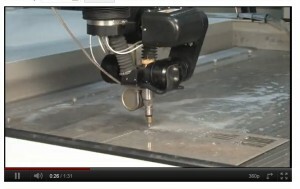 Remember—our goal is an abrasive waterjet system in every shop.